Ancient World history truly fascinates me. Seeing these ruins in Side, Turkey was just breathtaking in itself. The ancient village of Side, on the Turkish Mediterranean coast, whose name means "pomegranate" in ancient Anatolian, was once one of my "heavens on earth". Since then, I have discovered and enjoyed many more places on different continents, and given a longish rest to Side before rediscovering it in 2010. Side (pronounced sea day) lies about about 47 miles east of Antalya, halfway to Alanya, both popular, rather developed tourist resorts. The 30-minute drive from Antalya passes the ancient cities of Perge, Selge and Aspendos, all interesting historic sites to explore, and the Manavgat waterfalls, a nice cool spot to escape the summer heat. 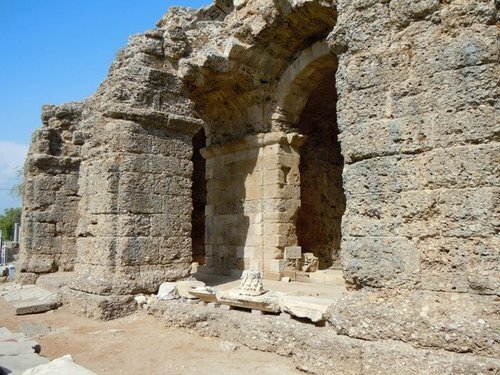 The Side Museum and Ruins are located in Side town of Manavgat District 8 km from Manavgat. Ancient agora bath from A.D. 5-6th centuries, dating from Roman Age, was restored in 1960/61 and converted into a museum. Has a capacity of 15,000 seats. The audience section is divided in half by means of a diazoma. Orchestra in a semi-circle curve. Stage building is two or three storey. Late Empire Period gladiator fights and animal fights were made here. In A.D. 5-6 th centuries during Byzantine Period it was used as an open air church. The theatre is dated from middle of A.D. 2nd century.The Apollo Temple is located within Byzantine Basilica together with the Athena Temple. In Corinthian style and peripteros design. From Roman period. Dates from A.D. 150’s. A section was restored in 1983-1990 and recovered. There are plenty of bars and restaurants, ice-cream stands and a nightclub in the middle of the ruins. The stone bar at the ancient harbour, just before the Apollo temple, is popular among locals – it's the perfect spot to watch the sunset with a glass of wine. Of course, peaceful Side is not a rival to that nightlife monster Bodrum. Nor can it compete with the Aegean resorts of Çesme–Alaçatı, with a vivid nightlife and windsurfing scene. Side is not Alanya (a crowded resort with a pebble beach), or an idyllic village like Kas, Kalkan or Kekova, west of Antalya. But it is a great place to rest for a few days.